There’s not much to say anymore. Just when there’s a glimmer of hope, the Chicago Blackhawks are thrown into yet more adversity. It’s hard to get back up when you get knocked down over and over again. The Blackhawks look and sound utterly defeated, and it’s difficult to watch. If nothing else, they’re building a whole lot of character as they try to rally and find some positives. Let’s look at the updates from this past week. The Hawks have now lost 10 of their last 11 games, including three of four this past week. In Winnipeg, they continued with the same old theme of slow starts, except this time it was especially brutal. The Jets lit the lamp four times before the Hawks rallied back with three goals of their own. But the Jets then added two more tallies in the third period to put the game away. Wednesday brought that glimmer of hope I mentioned earlier with a commanding 6-3 win over the Pittsburgh Penguins. Then the Hawks played hard again on Friday against the same Jets that stuffed them three days earlier. They came from behind twice, with Erik Gustafsson scoring the game-tying goal in the final seconds of regulation to force overtime. But alas, this vulnerable team couldn’t close the deal. Sunday’s tilt against the Sharks started out so well! The Hawks not only scored the first goal, but the second one as well. All in a span of 47 seconds! But they predictably let the Sharks right back in. San Jose tallied two goals in 42 seconds to tie the game. Ah, but then Brendan Perlini made it 3-2 with his first goal (and point) as a Blackhawk! The Hawks even chased Sharks’ goalie Martin Jones out of the net! But the wheels came off after goaltender Corey Crawford was knocked out of the game (more on this below) late in the first period. The Hawks returned with absolutely no compete level in the final two frames. They gave up five unanswered goals for the brutal 7-3 loss. It was a very disappointing end in yet another losing week. Desperate times call for desperate measures. 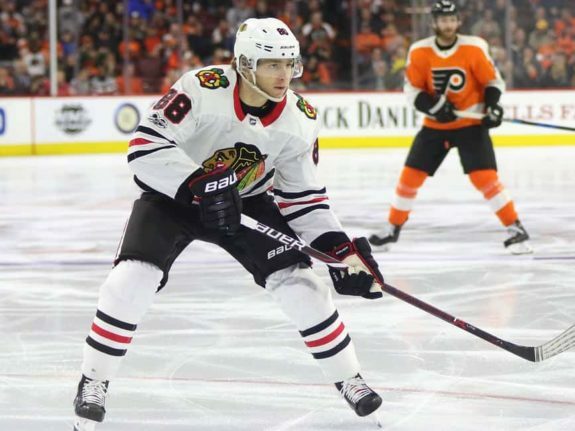 After their eighth straight loss in a row, the Blackhawks swapped some players with their AHL affiliate, the Rockford IceHogs. This past Wednesday, top forward prospect Dylan Sikura and defenseman Carl Dahlstrom were called up. In two corresponding moves, forward Alexandre Fortin was sent down, and defenseman Jan Rutta was placed on waivers Thursday (he cleared and reported to the IceHogs as well). These personnel changes come after future Hall of Fame coach Joel Quenneville has been fired, and Nick Schmaltz has been traded for two fresh faces from the Arizona Coyotes. It’s clear the Blackhawks are looking for any kind of salvation they can get. So how are things working out with the call-ups? All things considered, not too bad. Sikura got off to a bit of a slow start. In his debut against the Penguins, he recorded one shot on goal and two takeaways in 9:33 of ice time. He played on the third line with David Kampf and Brendan Perlini, although Colliton used him very sparingly in the third period. In the Jets game, he managed one shot on goal, one takeaway, and one blocked shot in 9:39 of ice time. But the Sharks’ game is where he seemed to get his feet under him. On the play shown below, Sikura earned his first point of the season as a Blackhawk. He powered through a blatant penalty and got the puck to the net, where his teammate Perlini then cleaned up the rebound for the goal. He also recorded a shot on net, two takeaways, and one blocked shot in 11:56 of ice time. No one expected much of Dahlstrom. As a matter of fact, some even theorized he was just a temporary call-up while Gustafsson was out sick. 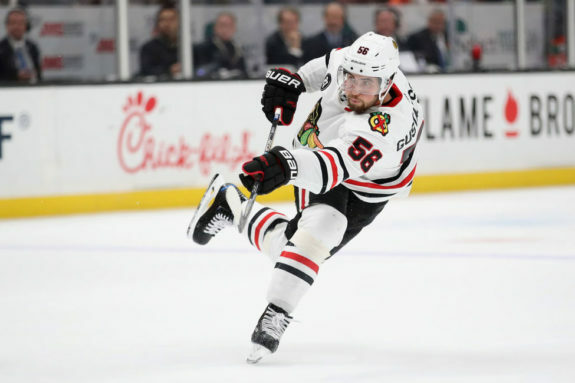 But he did enough in his 2018-19 season debut for the Blackhawks to place Rutta on waivers the next day. On Wednesday night against the Pens, it was Dahlstrom’s shot on net that bounced off Andreas Martinsen for that elusive first goal of the game. In a healthy 22:34 of ice time, Dahlstrom had three shots on goal, one hit, and finished the night with a plus-two rating. He played on the third defensive pairing with Connor Murphy, and even recorded 1:20 on the penalty kill. In the following two tilts, Dahlstrom picked up right where he’d left off. He was confident with the puck and played solid defensively. Colliton trusted him with shutting down the opponent’s top line, and Dahlstrom even earned his second assist in as many games against the Jets on Friday. He’s been a pleasant surprise, and hopefully can continue to impress. Considering the Blackhawks currently rank 30th overall in the league, I guess it’s no surprise their special teams’ play is in the dumpster as well. Which came first, the chicken or the egg? It’s no secret the Hawks’ power play has been anything but for the entire season and most of last season as well. But now their penalty kill is following suit. In the last four games, the Hawks have gone 1-for-10 on the power play. They’ve only scored three times in their last 41 tries. Overall, they’re dead last in the league, with 12 goals on 105 tries for 11.4%. Their power play has become laughable. Or cryable, if you prefer it that way. It’s like the Hawks are afraid to shoot. They just keep passing the puck and looking for the perfect opportunity. Even the big wigs (Patrick Kane, Alex DeBrincat, Jonathan Toews) are just passing, passing, passing. And they spend more time chasing the puck than getting set up in their own zone. How does that happen with a man advantage? It’s really quite the mystery. Meanwhile, the Hawks have let in six goals on 13 opportunities by their opponent while shorthanded in the last four games. Overall, they’ve allowed 29 goals on 103 opponent attempts, for a 71.8% success rate. In case you were wondering, this is also dead last in the league. Ah, good times! Yeah, I saved the worst for last. On Sunday night the Blackhawks’ netminder was involved in a collision in the first period where the back of his head hit the crossbar. He immediately left the ice and did not return. After the game head coach Jeremy Colliton announced Crawford had a concussion and was in concussion protocol. On Monday, the Blackhawks recalled IceHogs’ goaltender Collin Delia and placed Crawford on injured reserve. Considering Crawford dealt with concussion issues the entire second half of the 2017-18 season and throughout the offseason as well, this is a very serious concern. The players say this wasn’t why they came out flat in the second and third periods, but I’m sure it wasn’t easy to focus after one of your most important players was forced to leave the game. Obviously, we don’t yet know the severity of Crawford’s injury. But with his history and for the sake of his overall health, will Crawford consider stepping away from the game? Only time will tell. It’s hard to remain positive right now, especially after the Crawford news. But regardless of the outcome, this a professional hockey team. The show must go on. The players have to pick themselves up and try to make the most of their difficult situation. With that in mind, here are a few good things the Blackhawks can hang their hats on during this trying time. Defensemen Duncan Keith and Brent Seabrook played their 1000th game together this past Tuesday in Winnipeg. They are the only two defensemen in NHL history to do so. 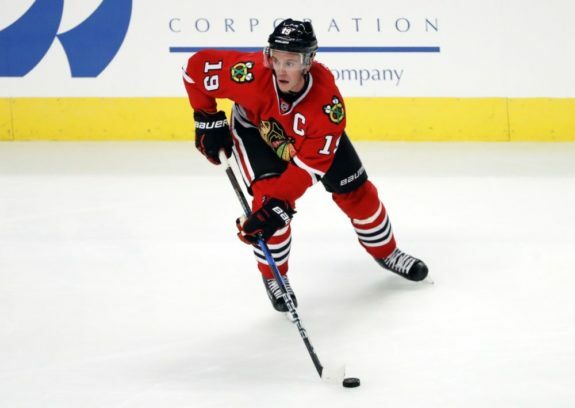 Captain Toews earned his 700th career point with a goal against the Penguins on Wednesday night. He finished the night with said goal and two assists, and added two more tallies and another helper against the Jets on Friday. Toews now leads the team with 16 goals. DeBrincat sits in third place with 14 goals (Kane is second place with 15). DeBrincat’s presently on a bit of a roll, having notched three goals in the last four games. Dylan Strome has suited up for 11 games with the Blackhawks. In that time, he has five goals (two in the last four tilts) and an assist. He’s also averaging right around 50% on the dot, taking a healthy amount of faceoffs as the second line center between DeBrincat and Kane. Right now he’s looking like a very good addition to the team. At some point, things might get a little easier, right? Well, not this week. The Blackhawks have another four games in six nights, three of them against division foes. They host the Nashville Predators on Tuesday, and then travel to face the Dallas Stars on Thursday and the Colorado Avalanche on Friday. On Sunday, they have one final home tilt against the Florida Panthers before the Christmas break. All we can really do is hope for more positives than negatives.